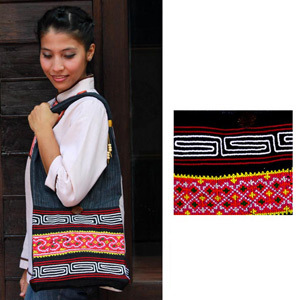 The Lanna artisans handcraft this shoulder bag with cotton. 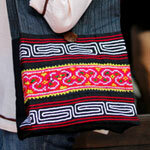 They decorate the front with motifs stitched by hill-tribe women and labyrinthine patterns. Cords and rain tree wood beads adorn the strap. Lined with cotton, the bag has an inner pocket. It fastens with a hoop over an elephant button carved from coconut shell.